In the museums it supports, the Guggenheim foundation calls for change, bold thinking and excellence, articulating the buildings as educational institutions and a hub for distribution of knowledge and culture. Suggesting a destination for the new museum at the beautiful northern port city Helsinki calls for articulation of a specific "language" or set of design "tools" able to reflect the dialogue between a very specific Finnish tradition and culture with the open, flexible Guggenheim international heritage. Alvar Aalto suggested that proximity to nature can give fresh inspiration and introduced the notion of "symphonic structure" who's shell is rooted deep in finish tradition. we propose a vision of the new museum as a "Terminal" or a "Vessel" rather than the prevailing "box" or "volume" type museums. In attempt to merge the Guggenheim approach of distribution of knowledge and beauty throughout the world (a task relying on transport system and infrastructure), in a manner synchronized with Finland's values ,we suggest a structure of bird migration patterns as they occur throughout the Baltic sea. 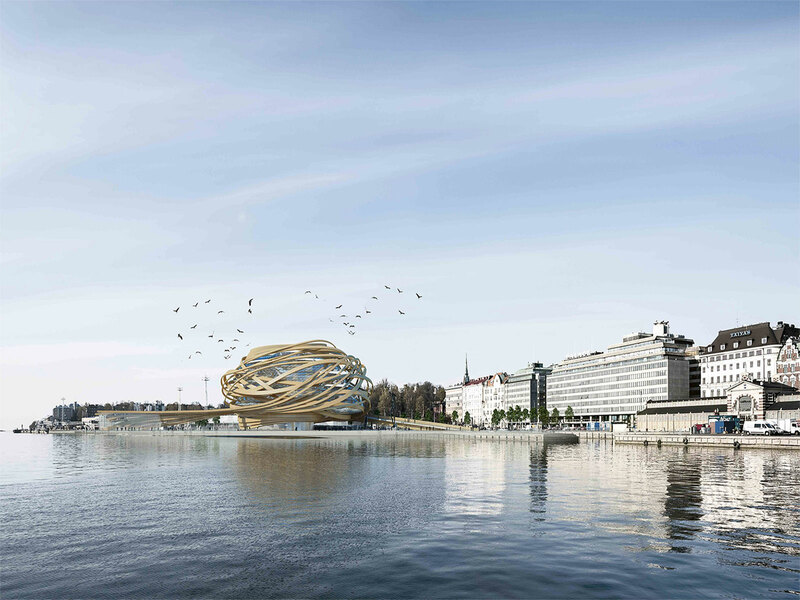 The birds, like the passengers crowding the port on their way to and from Helsinki, shift through the museum site in various paces, pick up fragments, shreds of knowledge and beauty, carrying them to their next destination. The museum is constructed mainly from layered, glued local timber bars and columns forming a "nest" like structure allowing wrapped inner glass skin to produce perfect climatic conditions suitable for a flexible program. The building is distinct, specific but not a stranger to the existing city sky line sequence. Thanks to the absence of perimeter walls, the galleries are flexible allowing the display of different types of art work, accompanied by external exhibition terraces to be used when the weather permits. The single core circulation system is coherent and easy to identify while always enabling wide views throughout the museum levels. The museum's public spaces, structure, passages and galleries, clearly portray universal characteristics of sustainability, freedom and surge of fantasy, join the urban collage, uniting with the city fabric creating great potential.